Glass, metal, paper. Length-13 cm, Width-4.7 cm. A brown glass 'SLOAN'S LINIMENT' bottle with a yellow lid and label. The label has a drawing and signature of 'Dr. Earl S. Sloan' and Chinese characters. There is an ingredient list on the side. 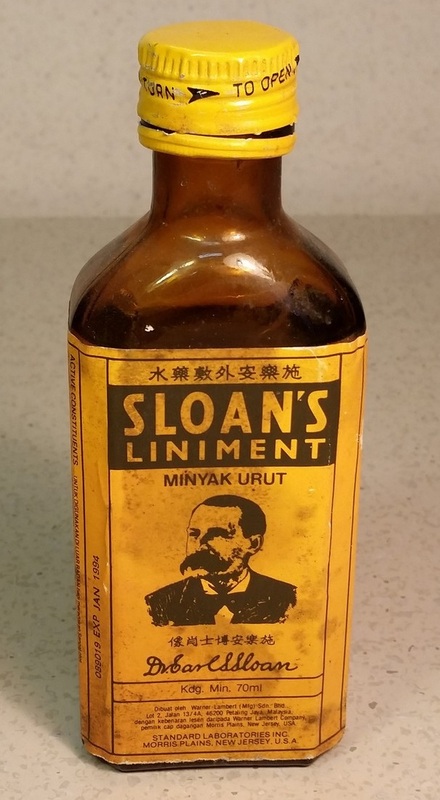 This product is by 'STANDARD LABORATORIES INC. MORRIS PLAINS, NEW JERSEY, U.S.A.' There is some liniment inside the bottle. The expiry date is 'JAN 1994'.